↑ More specifically, the electron neutrino. ↑ "Neutrino". Glossary for the Research Perspectives of the Max Planck Society. Max Planck Gesellschaft. สืบค้นเมื่อ 2012-03-27. ↑ Dodelson, Scott; Widrow, Lawrence M. (1994). "Sterile neutrinos as dark matter". 72 (17). ↑ Bahcall, John N.; Serenelli, Aldo M.; Basu, Sarbani (2005). "New Solar Opacities, Abundances, Helioseismology, and Neutrino Fluxes". The Astrophysical Journal. 621 (1): L85–8. arXiv:astro-ph/0412440. Bibcode:2005ApJ...621L..85B. doi:10.1086/428929. ↑ Olive, K. A. "Sum of Neutrino Masses" (PDF). Chinese Physics C.
↑ Improved understanding between 1930 and 1932 led Viktor Ambartsumian and Dmitri Ivanenko to propose the existence of the more massive neutron as it is now known, subsequently demonstrated by James Chadwick in 1932. These events necessitated renaming Pauli's less massive, momentum-conserving particle. 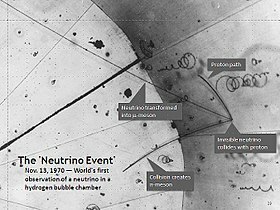 Enrico Fermi coined "neutrino" in 1933 to distinguish between the neutron and the much lighter neutrino. K. Riesselmann (2007). "Logbook: Neutrino Invention". Symmetry Magazine. 4 (2). หน้านี้แก้ไขล่าสุดเมื่อวันที่ 7 พฤศจิกายน 2560 เวลา 14:43 น.